The broader Nifty, after struggling, also managed to end above the 10,200-level. Buoyed by easing crude oil prices and a recovery in the rupee, the BSE Sensex on Wednesday recaptured the 34,000-mark by jumping 187 points after four sessions of losses as global markets bounced back. The rupee strengthened 42 paise to 73.15 (intra-day) against the US dollar in the forex market. The Sensex swung nearly 575 points during the session on heavy buying and selling by participants. 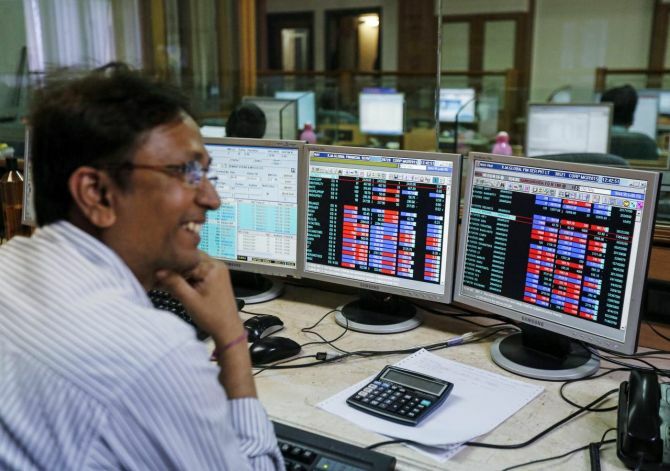 After opening on a strong footing, the Sensex quickly reclaimed the 34,000-mark to scale the session's high of 34,300.97 in early hours of trade, largely supported by easing crude prices and recovery in the rupee amid positive Asian cues. However, a sudden sell-off by investors dragged the benchmark into the negative zone. It hit a low of 33,726.07 points before finally concluding 186.73 points, or 0.55 per cent higher at 34,033.96. The gauge had lost 1,315 points in the past four sessions on weak domestic as well as global factors. The broader NSE Nifty too recovered by 77.95 points, or 0.77 per cent, at 10.224.75. Bear operators, who had been creating short-positions in the past several sessions, were seen covering up positions ahead of October month expiry in the derivatives segment Thursday, brokers said. Meanwhile, domestic institutional investors (DIIs) made purchases worth a net of Rs 116.41 crore, while foreign institutional investors (FIIs) sold shares to the tune of Rs 340.35 crore on Tuesday, provisional data showed.